I decided to take my oldest son on a mission trip to Guatemala to show him how blessed we are and to help show God’s love to the kids there. Prior to the trip, my wife and I had discussed sponsoring a child at the Learning Center. We decided if there was one that we bonded with, then we would consider making that commitment. We have sponsored a child in the past from Ecuador through another organization, but never really felt a personal connection with that child. We were praying for her, writing her, and sending money to provide for her, but never had the opportunity to form any type of personal relationship. God had special plans for this trip. It started with a visit to the homes of some of the children that attend the Learning Center. It was heart breaking to see the area that these kids call home. The safety and security we all take for granted are non-existent for these families. Walking through the midst of the filth and dilapidated structures, the thing that stood out the most to me was the joy on the faces of the kids we encountered. They don’t seem to worry about the things we would expect them to. Jesus said, “Do not worry about tomorrow, for tomorrow will worry about itself…” (Matthew 6:34). He wants us to rely on Him on a daily basis instead of taking it all upon ourselves. These kids live that passage out every day of their lives. As we began our week at the Learning Center, the kids immediately made us feel welcome and appreciated by overwhelming us with hugs as they got off the bus. During story time on the first morning, a very enthusiastic boy named Riveri sat on my lap and we had a great time learning about doing things to help others. Once I found out Riveri was not sponsored, I knew right away that God was calling my family to help this little boy. Knowing we can help him begin his young life with an education, daily meal, and vitamins is a tremendous blessing. As the week went on though, God was not finished working on my heart. I began to feel like sponsoring one child was not enough. We are so blessed and there is no reason we cannot do more to help. I asked the staff to let me know if there were any little girls that needed to be sponsored. On Wednesday morning, I was having a great time talking to a little girl named Vallery while she was coloring. As we were talking, staff told me that Vallery needed a sponsor. I knew God had put me in that exact moment and I had found the little girl we needed to help. This has been an amazing trip and I have seen God working in so many ways. The impact that Connection Pointe is having on this community and its children is simply amazing. God is truly using our church and its members to make life better for this entire area. Having the privilege of actually meeting and interacting with the children my family will sponsor has been a blessing beyond words. 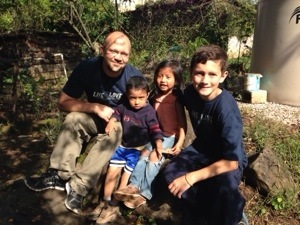 My prayer is that Connection Pointe will continue to support its global missions in Guatemala and that the members of our church will remain generous in the sponsorship of these beautiful children.